A few weeks ago I turned on my old Commodore Amiga A1200 which had been stored for 15 years or so. The idea was that my kids can use it as a game computer but tonight I couldn’t resist and I played some of the old games. 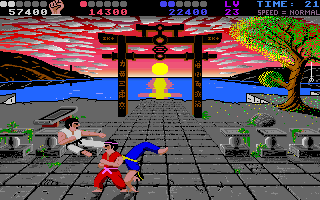 Do you remember International Karate+? It’s still a very nice game to play with excellent gameplay even though it seems that my Suzo Arcade joystick has had it’s best time (Luckily I have a 2nd one somewhere but I can’t find it). I also noticed there is an online flash based clone of International Karate+. It’s not’s as good as the real thing especially in the gameplay but it’s done very well. The backup has been restored and all downloads should be working again. If you do find a non working download please leave a comment.